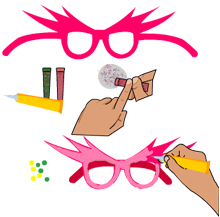 Draw the outline of the designer eyeshade on the pink paper as shown. Cut it out using a sharp scissors. Now spread some glue all over the eyeshade. Sprinkle some glitter on the glue. Place the colored sequins to form a design of your choice and keep the shade unmoved for a few minutes. It’s time now to put on the cool eyeshade and do a catwalk! !